It’s rare to see people looking through the want ads in the local newspaper for their job search nowadays. It’s simply easier to look online or use an app, plus you get many more results both locally and around the world. 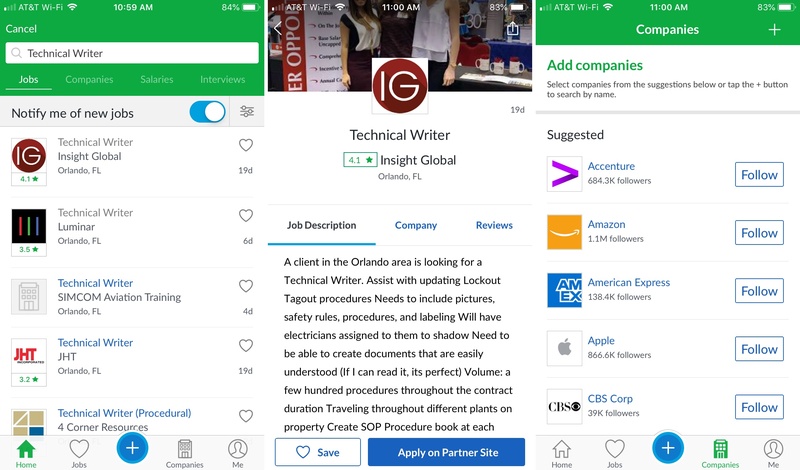 If you’re in the market for a new job and are wondering which app to use, these are the some of best job search apps for iPhone and iPad. Find jobs based on location and keyword with ZipRecruiter Job Search. The app is easy to use and only requires an email or Facebook login to get started. Begin with popular searches like part-time, customer service, sales, or no experience. Adjust the miles from the location where you want the job to search the surrounding areas. Filter search results by best match, newest, or date posted. Mark your favorites, share jobs, and apply from within the app. Create a profile that includes basics like education and experience as well as certifications, licenses, and associations. Plus, you can upload a photo and resume. With ZipRecruiter, you can set up notifications for new jobs and if your application has been viewed, so you never miss a thing. 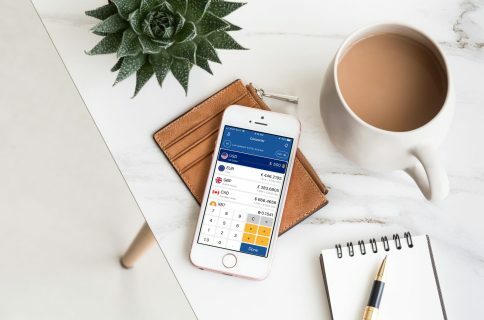 Indeed Job Search is another great app and you can search jobs without creating an account just to check it out. Just enter a keyword, location, or company to begin your search. Use popular searches like full-time, part-time, customer service, or retail. Sort and filter results by best match or newest, level of experience, job type, and distance. Follow your favorite companies and get new jobs and updates via email. 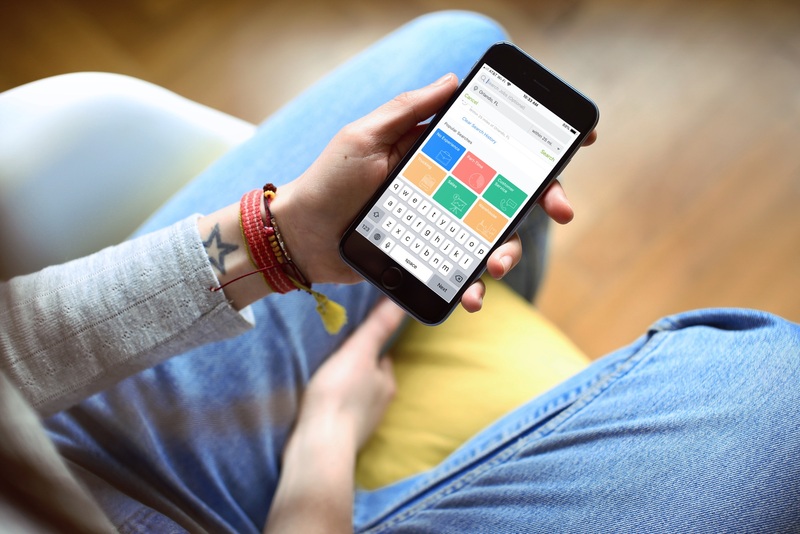 Save jobs, share job details, and apply from within the app. Sign up to apply for jobs with an email address and then upload your resume. 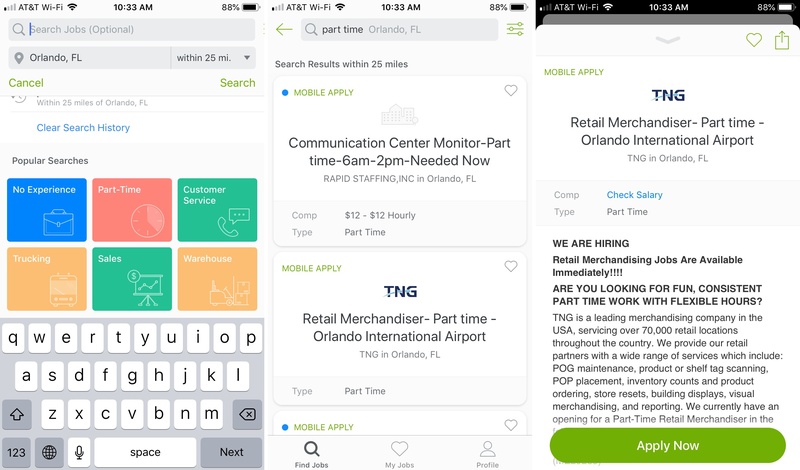 Indeed lets you search for jobs all over the globe, provides recommended jobs, and lets you look for jobs related to others you view. With Glassdoor Job Search, create an account with Facebook, Google, or your email. You can answer a few questions right off the bat to immediately help in your search. Or, just skip through and search on your own. View search results by job, company, or salary to narrow it down. Filter search results by dates posted, distance, company rating, industry, salary, and more. Mark your favorites, share job details, and apply for jobs with links to the hiring company websites. 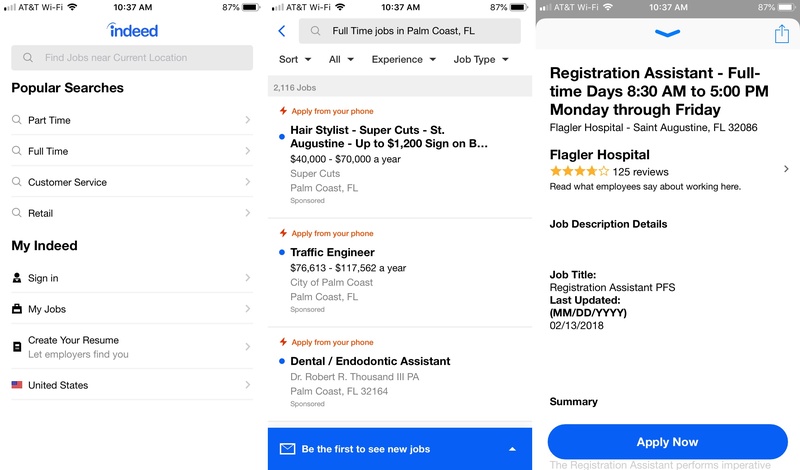 Save your searches and get notified of new jobs that pop up in the search. Follow companies that interest you so you’re abreast of job openings. 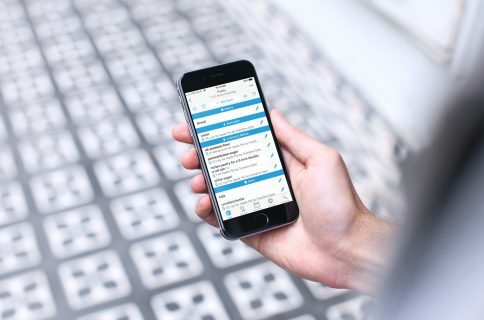 Upload your resume from Dropbox, Google Drive, or iCloud and get ready to find the job of your dreams with Glassdoor. Hopefully one or more of these job search apps will help you on your way to a new career. Let us know if one lands you a new job or if you have another you’d like to recommend to our readers. For more helpful app lists, check out our Best Of section.